Elements of Combinatorial Computing focuses on the processes, principles, methodologies, and approaches involved in combinatorial computing. The publication first takes a look at a language for combinatorial computing, language implementation and program efficiency, and computer representation of mathematical objects. Discussions focus on geometric configurations, elementary combinatorial configurations, sets and vectors, natural numbers, program optimization, data representation, set manipulation, notation for iteration and recursion, and nested iteration and recursive programming. The text then takes a look at backtrack programming, generation of elementary configurations, and additional basic techniques and manipulations. Topics include isomorph rejection, transformations, finite set covering, sorting techniques, permutations with repeated objects, compositions, partitions, subsets and combinations, and basic backtracking and impasse detection. The book examines additional basic techniques and manipulations and applications of advanced algorithms. 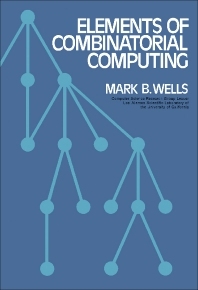 The publication is highly recommended for computer science experts and researchers interested in the elements in combinatorial computing.